This week: Be careful with claims of a 50,000-hour lifetime, a campaign to retain incandescent lighting for theaters, and a video introduction to LEDs. A lawyer in the UK has raised the issue of liability for LED suppliers if they are not careful with their claims of the expected lifetimes of the systems they sell. Many lamp vendors throw around figures like 50,000 hours, without taking much care as to exactly what they are promising -- and how a court might view the matter, years down the road. This issue came to my attention through the Innovations in Light interest group on LinkedIn. A very lively discussion ensued there around the question. It will only take one lawsuit for the industry to get more cautious about its lifetime claims. 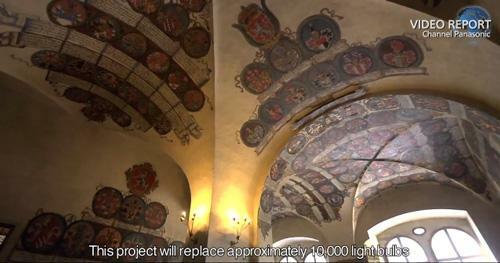 Panasonic is expanding in Europe, and one of the markers of its expansion is the company's selection as the supplier of LED light bulbs to replace 10,000 incandescent bulbs at Prague Castle, a UNESCO World Heritage site in the Czech Republic. The company developed bulbs that mimic the look of incandescents. Total energy savings is around 77 percent. Illustra Lighting has produced a series of 12 short videos, two to four minutes each, that together form a fine layman's introduction to LEDs and their use in lighting. It is pitched to the level of the ordinary homeowner. If you've been looking for a way to educate your Facebook friends about what you do, send them to the table below. Most of the content is straightforward and factual; the only foray into opinion I noted was in part 12 where the presenter, Illustra's Sammy Habul, places the suppliers of LEDs into quality tiers. You may find that you disagree with his characterization of some suppliers, as I did. I could not find a compact list of the videos, with links, either on the Ilustra site or on YouTube, so I put together the one below. Part 1: What is LED and Why Is It Different? In the EU, the phasing out of incandescent lights is about a year ahead of its schedule in the US. So it's not surprising the backlash against the ban on tungsten filaments in theaters started in Europe. It has gone worldwide now. Among other concerns, theater owners and lighting designers fear that outlawing incandescent lighting "may spell disaster for many small amateur theaters and drama and operatic groups, community theatre venues, and school theaters," which don't have the resources to replace entire systems of lighting with LED-based equipment. They may have a point, but the arguments as a whole smack of special-interest pleading: "Well-meaning rules to reduce the impact of man-made climate change must not be allowed to have a serious impact on professional and amateur theatre." What if every lighting user argued that way?